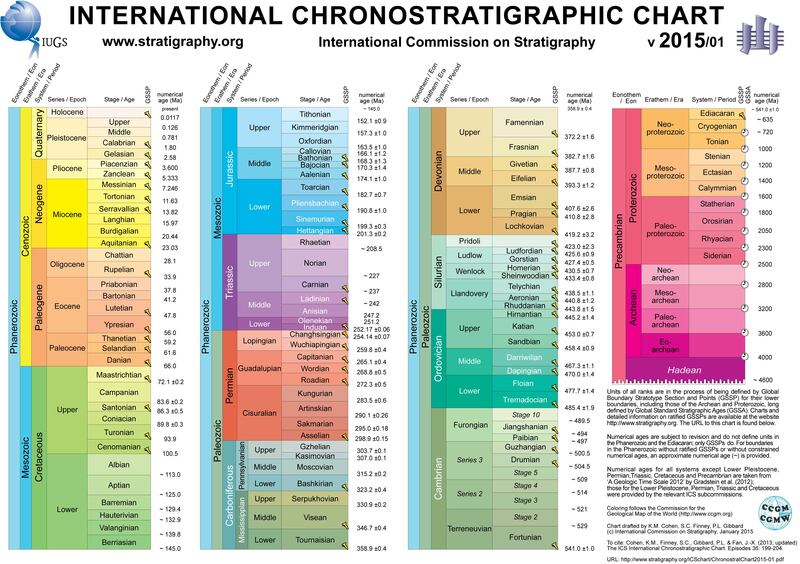 In the geologic timescale the Bathonian is an age or stage of the Middle Jurassic. It lasted from approximately 168.3 Ma to around 166.1 Ma (million years ago). The Bathonian age succeeds the Bajocian age and precedes the Callovian age. The Bathonian stage takes its name from Bath, a spa town in England built on Jurassic limestone (the Latinized form of the town name is Bathonium). The name was introduced in scientific literature by Belgian geologist d'Omalius d'Halloy in 1843. The original type locality was located near Bath. The French palaeontologist Alcide d'Orbigny was in 1852 the first to define the exact length of the stage. The base of the Bathonian is at the first appearance of ammonite species Parkinsonia (Gonolkites) convergens in the stratigraphic column. The global reference profile for the base of the Bathonian (a GSSP) was ratified as Ravin du Bès, Bas-Auran area, Alpes de Haute Provence, France in 2009. The top of the Bathonian (the base of the Callovian stage) is at the first appearance of ammonite genus Kepplerites. A Chinese ankylosaur which lacked a club at the end of its tail. Its species epithet honors the main actors of Jurassic Park. A 4-foot-long (1.2 m) bipedal herbivore that was built for speed. It was discovered in one of China's many Callovian deposits. Bathonian to Callovian Lower Shaximiao Formation, Sichuan, China A small ornithischian dinosaur distinguished from all other basal ornithischians by a single autapomorphy, the presence of a marked concavity that extends over the lateral surface of the postorbital. 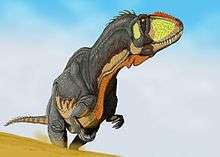 A poorly known Chinese ornithschian that may be related to Hypsilophodon and Lesothosaurus. It was small and vegetarian. Dashanpu Formation, Sichuan, China A 5-foot-long (1.5 m) Chinese herbivore in the family hypsilophodontidae. Abrosaurus was a small (30-foot (9.1 m) adult length) sauropod from China with an unusual skull. A sauropod named after the mountains where the mythological figure that held the world on his shoulders, it attained lengths of 15 meters (50 ft) and lived in Morocco. A poorly known English sauropod with heart-shaped teeth. 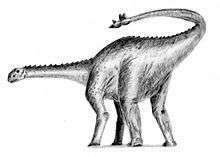 Lower Shaximiao Formation, Sichuan, China A 10-metre-long, fairly short-necked sauropod with a short deep skull, with fairly robust spatulate teeth. Its tail ended in a club, probably used for fending off enemies. 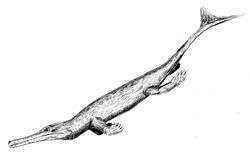 The most plesiomorphic known metriorhynchid. An 11-to-13-foot (3.4 to 4.0 m) predator from China whose discovery was assisted by the petroleum industry. A 5-foot-long (1.5 m) European theropod. The first dinosaur to receive a formal scientific description, Megalosaurus was a 30-foot (9.1 m) carnivore which prowled Jurassic England. A Chinese theropod. Specimens from this time period were formerly classed as a separate genus, Szechuanosaurus. ↑ López, Fernández; Rafael, Sixto; Pavia, Giulio; Erba, Elisabetta; Guiomar, Myette; Paiva Henriques, María Helena; Lanza, Roberto; Mangold, Charles; Morton, Nicol; Olivero, Davide; Tiraboschi, Daniele (2009). "The Global Boundary Stratotype Section and Point (GSSP) for base of the Bathonian Stage (Middle Jurassic), Ravin du Bès Section, SE France" (PDF). Episodes 32: 222–248. Archived from the original (PDF) on 4 March 2016. Retrieved 5 June 2015. 1 2 3 4 5 6 7 8 9 10 11 Sepkoski, Jack (2002). 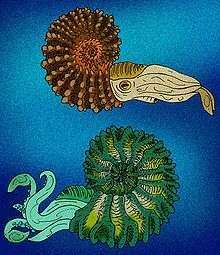 "A compendium of fossil marine animal genera (entry on cephalopoda)". Bulletins of American Paleontology. 364: 560. Archived from the original on 7 May 2008. Retrieved 3 April 2008.